If you are looking for the most beautiful, romantic place in the world this may be it! This is one of the few Puu Poa condominium units with the iconic 'Bali Hai' view. Our condo sits on the edge of a bluff, with full unobstructed white water ocean and mountain views that are too beautiful to believe. 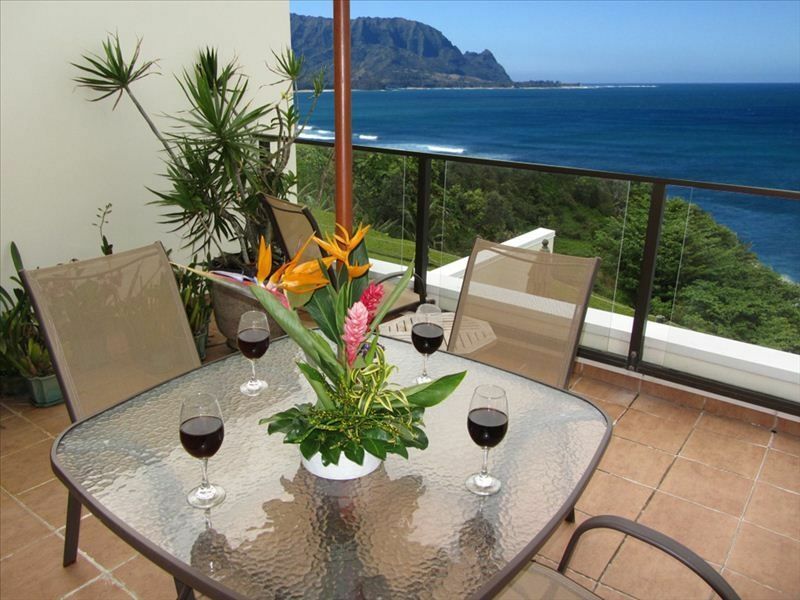 Puu Poa is THE premier luxury/view condo on the North Shore of Kauai, in Princeville. The newly refurbished St. Regis Hotel is just yards from the condo and all their restaurants (one is a Jean Georges Vongerichten restaurant) and their beach are available to our tenants. There is also a winding path to the unbelievably picturesque Hideaways Beach below our bluff, where possibly the finest coral reef for snorkling can be found. The fabulous Makai Golf Course, which is 27 holes, designed by Robert Trent Jones Jr. is steps from the door. The famous Prince Golf Course, 18 holes, is minutes away. Tennis is available for free onsite. Rent this spectacular luxury condo for the vacation of your dreams. You will not be disappointed! Lynn and I have a son and grand daughter living on Kauai so we come and visit as often as we can. The condo has the feel of a home rather than a 'rental condo package' and it is appointed and equipped like our home. Again, one of the few units with A/C throughout unit. We have an unobstructed whitewater view of Pacific Ocean looking West. All of Princeville sits on bluff about 180 feet above ocean and a beautiful view of Hideaway Beach below. We have the best Kauai view of Mt. Makana, called 'Bali Hai' as seen in the Movie, South Pacific. We can watch the clouds drift into the valleys of the Coast (Na Pali) mountains, looking too beautiful to be real, sometimes we feel like it must be a painted backdrop!! Totally unobstructed view of the surf, including surfers! We are much closer than the pictures show,enabling us to see turtles when the sea is calm and feel the spray when the surf is up. Sunset is unbelievable as the water looks like tahitian pearls in the relecting light. We can see whales from the lanai and sit at a height that lets us watch the 'sets' of waves roll in. It is hypnotic! installed A/C January 2016. There are 4 split Mitsubishi units throughout condo. One in living room, one in kitchen/dining room, one in guest bedroom and one in master bedroom. Check your email while watching for whales! Ice Maker, front water and ice dispenser side by side. 18 ft. x 22 ft. outdoor private lanai off the living room with table, 4 chairs, shade umbrella and 2 chaises, surrounded by beautiful orchids and ocean front view that cannot be beat ANYWHERE!!! Our family of four enjoyed our stay immensely. The view is fabulous! The condo is beautifully maintained. And there are two great beaches to walk to. This was our first time spending a chunk of time on the north side of the island. We spent the first half of our trip in Poipu but wish we had spent it all here. We all were sad to go and hope to come back again! We got lucky with the weather and had a great stay in this spacious, well equipped condo with a spectacular view. The large kitchen had everything we needed to cook most of our meals there. Beach towels were provided, the pool was warm, and a notebook of suggestions and directions was helpful. Makai Golf Club and the beach are close by. Sunsets were breathtaking. Beautiful views from a great condo. We very much enjoyed our stay at Puu Poa. Mark was an excellent host. Our only complaint was the weather (bad timing on our part). We didn't get to spend as much time as we would have liked enjoying the view and the ocean breeze. This condo is located in Princeville. It's location was very nice as it was overlooking Hanalei Bay, walking distance to St. Regis and a quiet location. The unit has 2 bedrooms, although we only used the master. Master bath large and a great walk-in shower. The kitchen was very well equipped, very modern and welcoming. The sun room and living room offered spaces to relax and chat. We did grill and eat in one evening and found everything in working order. Although not customary in Hawaii to have air conditioning, it was nice to have the units when the humidity was high. We did not use the AC the whole time as we like to have the screen doors open off the lanai to hear the sound of the surf - delightful! Thank you for this wonderful stay - easy access to unit from parking lot and lots of parking spots. Very spacious, clean and comfortable! Lovely area and accommodating owner was very easy to work with. I would highly recommend and would love to come again. The condo had everything we needed and felt like we had stocked it ourselves. Beautiful view of the ocean AND mountains. Near several great beaches. If you like to cook and plan to do so on vacation this place has a great kitchen that is fully stocked with all the gear you will need! Close to the lovely city of Hanalei which doesn’t feel too touristy, has a great farmers market, river and ocean activities. Keyless entry was the thing you never knew you needed in a rental until you have it here! The owner also left lots of great notes on the area, detailed instructions, and was super helpful with everything. Several great options in the condo to have a coffee or drink with a view! There is a Spa nearby. Helicopter sightseeing is a short ride away. The 5 star St. Regis hotel is right next door and you are welcome at their Jean Georges Vongerichten Michelim awareded chef restaurants, lounges and beach (just not on their chaises).